This article was originally published in Cloud961's November 2013 issue. 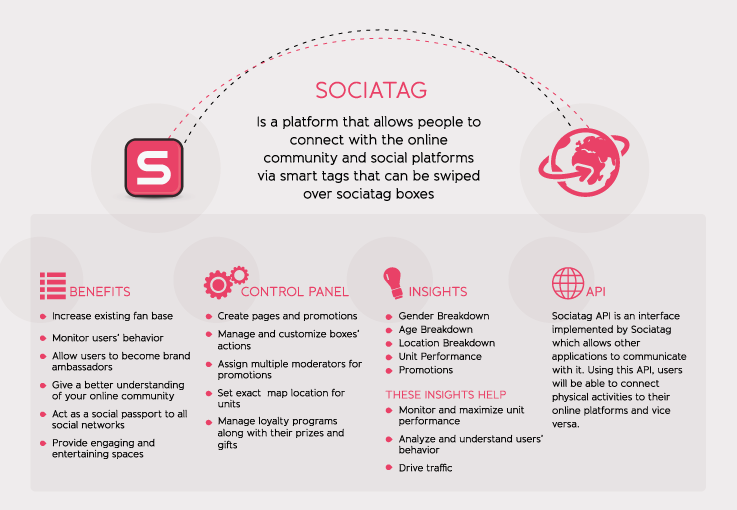 Sociatag offers a new solution for offline marketing via social networks. It allows users to directly connect and share their experiences in exhibitions, workshops and seminars with their friends, using appealing boxes that can be deployed on site. It adds a whole new dimension for the events, shops or restaurants by taking them to the online community. The Sociatag boxes are easy to install and can be fully branded in accordance to the brands' guidelines. Boxes can be Facebook Post Likes, Check-ins, Photo-booth or Simple Posts. They can also be linked to Twitter to post a predefined tweet, or Foursquare for check-ins as well. LinkedIn boxes also allow users to follow companies, join groups, bookmark job postings or simply share posts with their network. Rating boxes are available as well to get direct feedback from users. 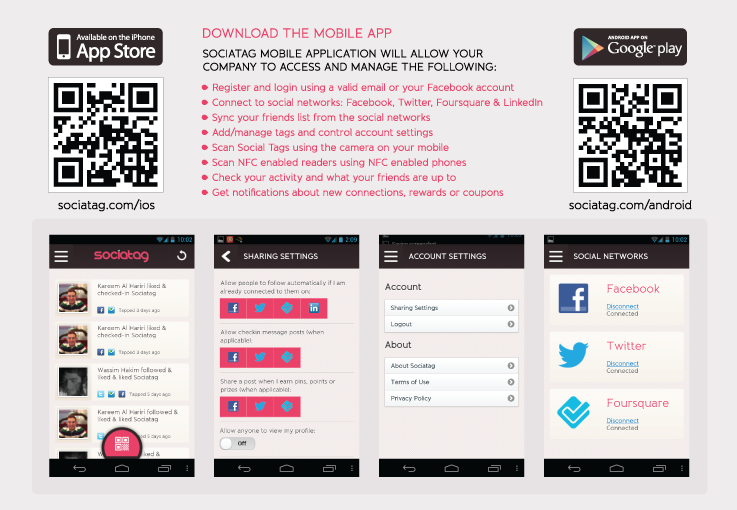 The options are endless, and more social networks are currently being added to the Sociatag family. The registration process is simple and takes between 1 and 2 minutes for each user. 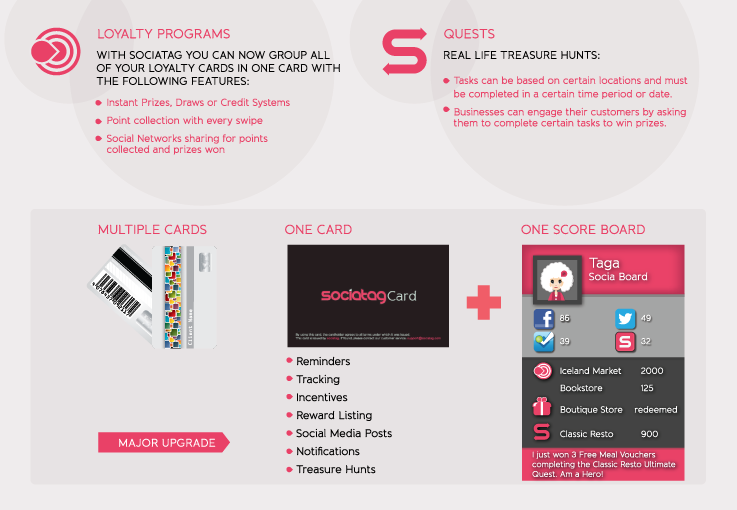 In addition to the social aspect, Sociatag offers loyalty programs, treasure hunt and gift voucher promotions for brands, all this using the same boxes that can be configured through the portal. Point collection can be as easy as swiping a simple card or tapping an NFC-enabled phone. Sociatag have implemented the solution for STC at Gitex in which participants were able to take pictures and like STC page statuses directly using the boxes. Each day a draw was made for the participants for a chance of winning a valuable smartphone as an incentive to visit the booth. 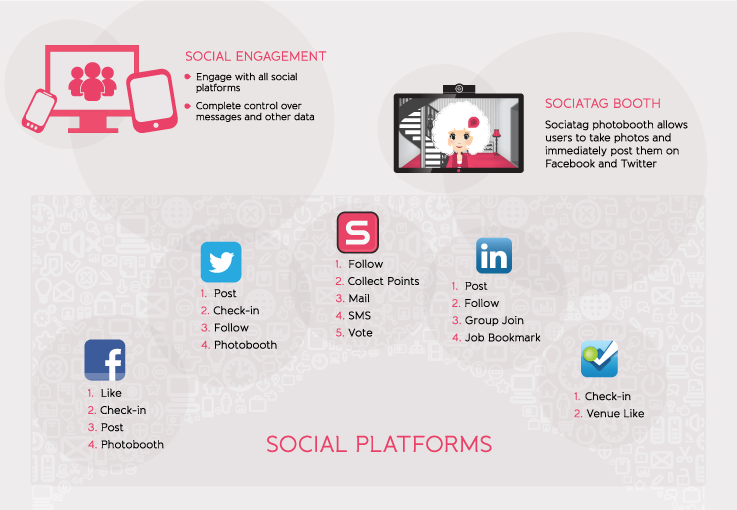 Moreover, Sociatag was part of some major tech and entertainment events such as Arabnet Digital Summit, The Social Media Awards,Toyota Sandance Dubai, Forward Recruitment Forum and much more. What Does Sociatag Bring as an Added Value? Makes spaces more fun and engaging. Increases social and digital presence of brands. Have better insights into businesses consumers’ behavior. Works on a new technological, digital concept that will develop businesses’ interactions with the customers using a multi-functional API. Brings the best digital experiences to customers, stores, brands and event organizers through innovative and real-time digital experience. Increases the understanding movements, preferences and interactions gives valuable insight to engage the audience post event and help shape future events. Redefines loyalty programs by giving them a new social aspect, in addition to providing features that will attract customers such as reminders, incentives, live tracking and more. Sociatag is took part of the Web Summit 2013 in Dublin. The Web Summit is the biggest tech conference in the world, and it has selected the best 500 startups from all over the world to exhibit their startups at the Summit. And the best part is that Sociatag was voted among the best 30 startups in the world! Find out more about Sociatag by visiting sociatag.com. I appreciate exactly what you’ve supplied to those people who wish to learn as often about international business marketing. Your site is obviously one of several better ones out there.